When it comes to your home, flooring is important in each and every room you inhabit, but there are some rooms in your home that require more thought; the bathroom being one. Regardless of the room you are selecting flooring for, it’s always important to consider your budget, your style, and the flooring requirements of that specific room. Big questions to run through are, “how does it look,” “how does it feel,” and “how well does it repel stains and water?” Once you can confidently answer those questions with your flooring options, you’ll be better able to select your new bathroom flooring! Carpet is the worst flooring selection for your bathroom, with hardwood being a close second. While hardwood brings a warm and polished look to your floors, over time the moisture will ruin the hardwood, making this a “bottom of the totem pole” choice. Save the hardwood for your kitchen! Laminate is easy to clean, durable, and available in various styles, but if the base comes into contact with moisture, the laminate will begin to bubble, and will eventually need to be torn out and replaced. If selecting laminate, just be cautious of excess water being splashed out of the bathtub by energetic kids! Vinyl, which is budget-friendly and extremely easy to clean and maintain, is the most popular bathroom flooring choice with consumers. While vinyl is waterproof and stain-resistant, keep in mind the importance of choosing a quality vinyl, as the higher quality products will be better able to reduce the risk of water seeping under. The best flooring option for your bathroom is tile. Durable, budget-friendly, waterproof, and stain-resistant, tile not only cleans well, but it also brings a classic look to your room. If you have children or elderly family members in your home, consider being cautious and choosing a slip-resistant tile. 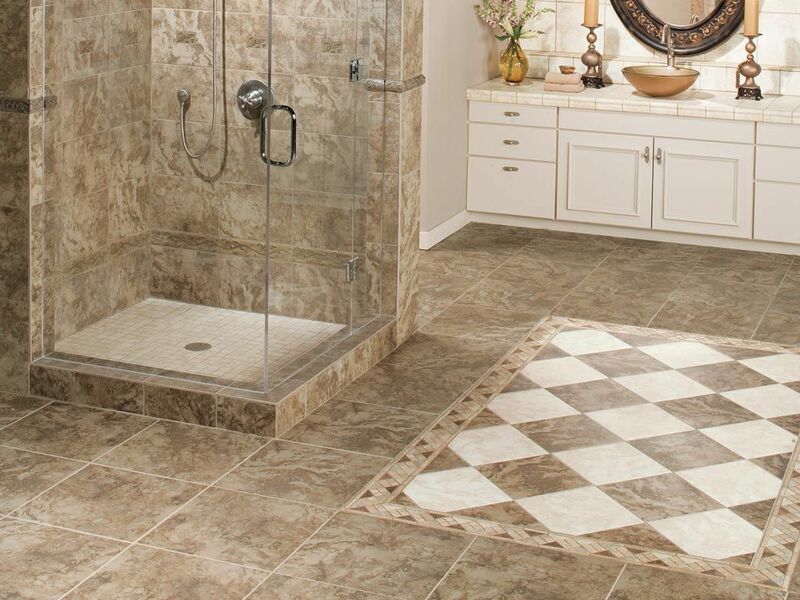 If options for slip-resistant are limited, go for smaller tiles, as more grout means less slip. One of the only downsides to tile is that it gets cold, especially in the winter, so if you have room in your budget, consider installing a floor heating system to keep your feet warm on the colder days of fall and winter! If you’re still unsure of which flooring would be best for your bathroom or simply want to ask questions, visit us in our showroom and we would be more than happy to go over the proper flooring products to fulfill your requirements! What is your favorite type of flooring for the bathroom? With the New Year upon us, it’s time to start taking note of any updates or décor changes that you would like to make to your home. Updates can range from new flooring, updated furniture, new wall colors, or a complete flip of a room. A new year encourages people to try new things that they otherwise wouldn’t consider, and we are here to give you 3 adventurous trends to try in 2015. Brighter and more elegant than in years past, gold fixtures are once again coming back into the spotlight as an accent for bathrooms and kitchens. Gold fixtures, when used appropriately and in conjunction with the room’s current décor, can add a touch of glamour or vintage charisma to the room. A gold faucet and drawer handles give a feeling of elegance and charm when paired with light wood, white cabinets, or marble countertops. Another hot trend of 2015 is to create a visual impact with the addition of fabrics and patterns into your décor. Whether it’s via pillows, curtains, or artwork, adding texture to your space with geometric patterns, floral prints, ethnic prints, and images will become a popular design aspect. If you’re feeling bold incorporate a cowhide or fluffy rug into your room to bring texture to your floors. Marking its spot in modern décor is the use of matte finishes in your home. Not only does matte add character and depth, but it can also add edge to your room, especially when matte black is used. The cozier, more inviting shade of black softens the harsh color, transforming your room from drab and dark, to dramatic and elegant. To balance the matte black in your room, incorporate furniture or accents in a soft white, and for those with a family, using a matte black wall as a chalkboard can add a touch of warmth to your walls. What décor trend of 2015 are you most excited about?